Find yourself on the rooftop of the Rockies! 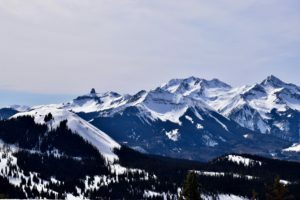 Whether you are staying in Mountain Village or Telluride let our Sitters chaperone the kids around this gorgeous town while you adventure, relax, or both! The Gondola is free day and night – so check out activities in either location! Ask your sitter to show off Butch Cassidy’s first bank robbery on the walking tour at the Telluride Historical Museum, or head inside and pan for hidden gems! Head to Town Park where you’ll find a kid’s fishing pond for 12 and under and the Imagination Station playground – open year round! You’ll also find a sledding hill and two ice rinks in the winter! For educational fun, the Wilkinson Public Library boasts an incredible children’s rooms with a treehouse, costumes, puzzles, plus arts and crafts! Mountain Village is a great place to walk around, grab a hot chocolate, or go for an ice skate in the winter. In the summer find a playground at Sunset Plaza and a ropes course for all ages. Check out the fee concert series on Wednesdays during June and July! Has the weather got you stumped? Head to the Ah Haa School for the Arts for a series of creative classes – painting, jewelry, ceramic, and more. Or check out the classic Nugget Theater for a movie day or night! REQUEST YOUR TELLURIDE BABYSITTER NOW! Resort Sitters is owned and operated by three long-term friends. We’re registered and insured in the states of Colorado and Utah. We care for children and special needs clients of any age. It is our privilege to give vacationing families a stress-free babysitting experience! WANT TO BECOME A SITTER? We are always looking to add excellent sitters to our team. If you’re interested in joining Resort Sitters, please complete our online application to begin the hiring process. Daytime sitters are in high demand across all locations! Expect fastest email responses during these hours, of course sitters are always available. Reservations require you to complete our online form.